Downspout Rain Drain Leak Repair Using Trenchless Pipe Lining – No Excavation! Don’t Excavate Walls To Repair Leaking Downspout Rain Drains! 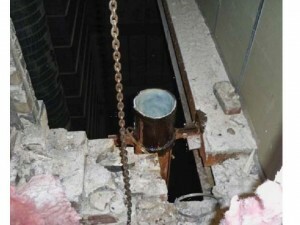 All across the United States leaking cast iron downspouts range drains are being excavated out of solid block concrete walls in high rise buildings and prominent structures in order to repair the leaks. 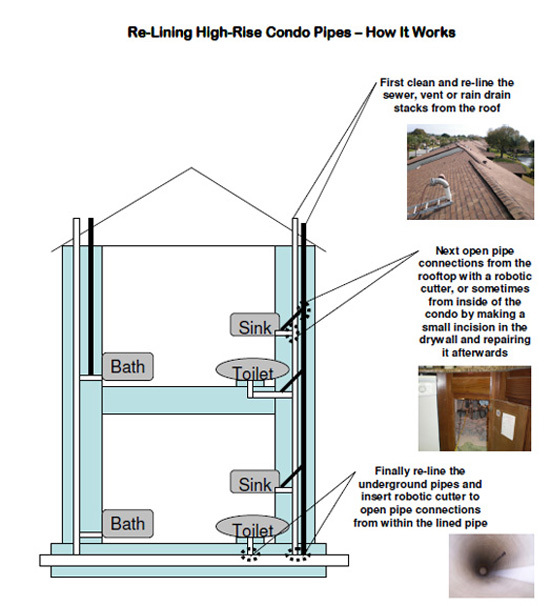 Modern technology allows the repair of leaking downspouts by using trenchless pipe relining which last 100 years. No excavation is required and it only takes 4 hours. Depending upon the brand, the downspout pipe lining will have a warranty ranging from ten to fifty years. 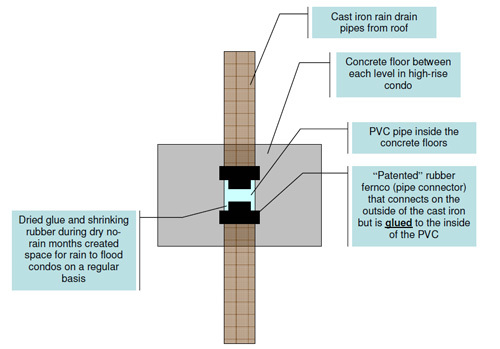 How did is downspout pipe lining work? First the leaking rain drain downspout is inspected with a sewer pipe video camera in order to determine the length of the pipe that has to be relined. Sometimes it is tempting to reline only the leaking part of the downspout. However, the entire pipe has experienced the same environment and is the same age and therefore will leak through its entirety soon after the downspout pipe lining was installed. In order to save mobilization costs it is therefore wise to reline the entire leaking down spout. After the video inspection, a pipe lining material usually made of polyester felt and/or fiberglass interwoven, is cut to length. It is essentially a very long white sock which is then saturated with an epoxy which has its own exothermic reaction and heats up to a high temperature where it hardens. The alternative is that the epoxy is hardened using steam. The drawback of steam is that it could potentially hurt the installer is if there was a leak. The advantage of steam is that the curing only takes around 60 minutes as opposed to the exothermic reaction which can take up to 4 hours. Since it is a rain drain speed is all the importance if any rain is expected on the installation date. The next step is to insert the epoxy resin inside the lining and a heavy linoleum roller is used to push the resin throughout the lining. Once the lining is completely saturated it is either dropped into the roof drain from the rooftop or it is pulled up to the rooftop from an access point at the ground level, or it maybe shot into the roof drain from the rooftop using an air inversion technique. The installation method depends on the number of bends and the access points in the pipe. 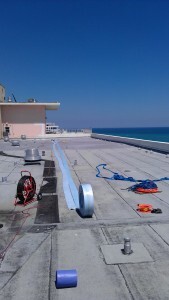 Record breaking downspout rain rain pipe lining installed in Miami Beach Florida. In 2013 a 16 story high rise building was experiencing leaking rain drain that were 5 inch in diameter. The lower floor had no access to pull the pipe lining up into the pipe because the walls were adorned with marble that could never be matched if it were the excavated. So the installation had to occur from the rooftop. However the line and could not be lowered into position because of multiple bends in the roof. This meant the only alternative was to use the air inversion technique to shoot the lining into position and thereafter shoot the calibration tube, which is a balloon, into the lining. The challenge however was that once the lining was shot into position it would hang and exert a 250-pound pull on the equipment on the rooftop. That is until the balloon could be inverted into the pipe lining and then inflated. So the challenge to install the balloon into the lining that is trying to pull everything down into the building. A local pipe lining installer, Trenchless Pipe Lining, LLC, had a proprietary method to do this. The second challenge was the pipe lining material was so long and bulky that the heat activated resin would harden from sunlight before the lining could be inverted into the pipe. To get around this the Trenchless Pipe Lining, LLC, installed all the pipe lining materials at night time from the rooftop elevated 160 feet in the air. In all they installed 5 such linings in the downspout rain drains with perfect success. We re-lined 5 x 100’ four-inch rain drain stacks from a rooftop in Boca Raton, FL (video on our web site) in 2 days for a cost of $50,000. There were no pipe connections to open afterward so the job was fast and relatively inexpensive. 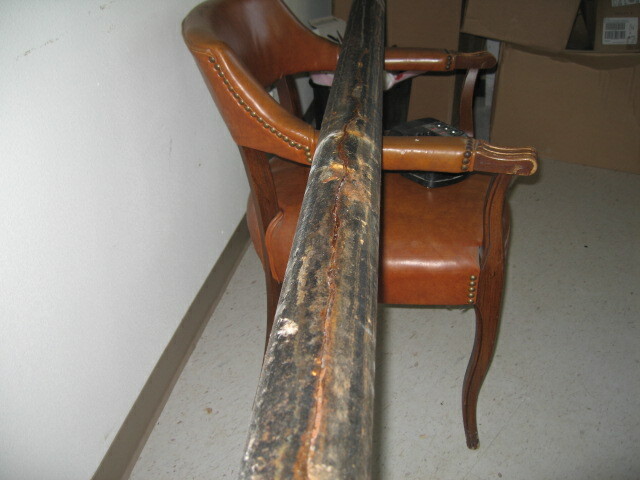 Each pipe had 3 x 90 degree bends and was leaking into the condos though poorly connected joints, which once lined over, stopped leaking of course. 40-50 years ago a revolutionary rubber pipe connector was invented and patented and then used to attach PVC pipes to cast iron pipes. Since then the invention disappeared and here’s why: it was unique in that it could fit around the outside of cast iron pipes and has a tapered end allowing it to be glued to the inside of PVC pipe. The problem was that after a few decades of drying and shrinkage, the glue and rubber separated from the inside of the PVC, creating leaks. We re-lined all 5 one-hundred foot stacks from the rooftop in two days, without disturbing the privacy of the million-dollar condo residents. When high-rise condos have leaks in their cast iron vertical sewer pipes or rain drain pipes, the inside of the condos become flooded. The cost of repairing drywall, mould control, carpet and tile replacement, and painting is very high. To solve this problem the old-fashioned way by removing drywall or concrete, replacing the cast iron with PVC, and then replacing the drywall and tiles floor by floor can run into the hundreds of thousands if not millions of dollars per building. Also, tenants have to move out for the duration of the construction, which lasts months. 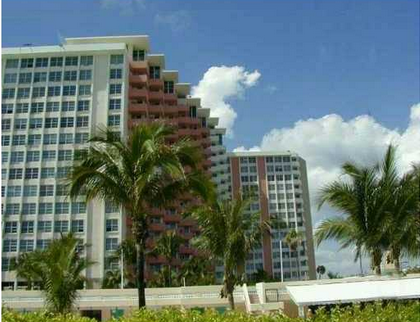 In addition, strangers (workers) are inside your tenants’ condos which raises privacy and security concerns. One 4” cast iron sewage stack in a 10 story building will take 10 days to replace and cost around $30,000. To re-line the same stack will take 1-2 days and cost $10,000 – $15,000. The work can usually be performed from the rooftop only without invading the privacy of tenants. It’s Only New To You! Most of us will live an entire lifetime and fortunately never experience the need to replace pipes. And if you have never had the problem, you probably are unaware of the array of solutions. The fact is however, that pipe lining for large diameter pipes (10” – 72” in diameter) has been around for four decades, originating in Europe and Japan, but the technology for smaller diameter pipe lining has only been around for about 10 years. In fact, Perma-Liner, the manufacturer of our materials, was the leader in pioneering new ways to install these liners.